Are considered standard by ISO (International Standardization Organization ISO) container height 8 feet 6 inches (2.59 m) having the designation DV «Dry Van» or DC «Dry Container» (e.g., container 20? DC, container 40? DV). There are also containers height of 9 feet 6 inches (2.90 m) having the designation HC «High-Cube» or HQ «High-Quantity» (e.g., container 20? HC, container 40? HC). 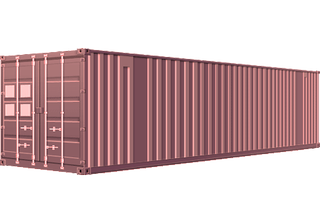 The most common ISO containers are containers of 20 feet and 40 feet, a width of 8 feet (2.43 m). This cuts formed « TEU » (20-foot equivalent) and « FEU » (40-foot equivalent), which is a measure konteynerovoznyh loading ships, terminals for unloading containers and freight railway stations. There are also PW (PW - Pallet Wide Container -. An enlarged width container, the inner width of 2.44 m, 2 allows loading pallet width 1,20 m in one row), OT (a tarpaulin, opening roofs), HT (c metal, opening roof). The dimensions are selected so that the container 20 feet, 40 feet, 45 feet can be transported by truck, rail transport and container ships. Shipping containers, originally manufactured by American standards. But because their sizes are not suited to European driving conditions, the International Organization for Standardization (the ISO), after lengthy negotiations, was put in force to this day, a standardized (ISO 830 1981) container. 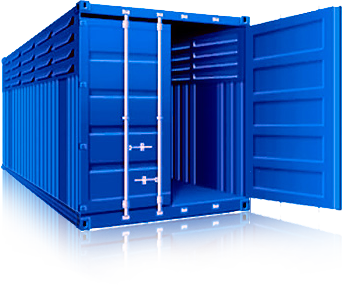 Net weight 20 ft container is 2300 kg, 40 feet container 3900 kg. Loading container 20 feet is about 21.7 tons to 33 m ?, 40-foot container of about 26.5 tons to 76.6 m ?. These are standard rules, but when loading the container should take into account the total weight, including the weight of the trailer. For transporting boxes of goods on pallets using standard 20 feet containers, 40 feet, 45 feet. For the transport of heavy loads (e.g., large-sized machine parts) there are heavy (heavy tested) containers of 20 feet, which differ from the standard 20-foot containers, general weight 67.200 lb (30.480 kg), the empty weight of 5.290 lb (2.400 kg), payload 61,910 lb (28.080 kg). Values ​​represent averages. 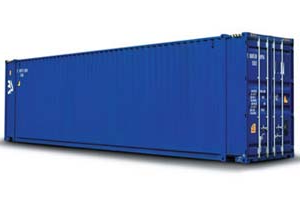 In recent years, 45 feet container length (13.72 m) was introduced. It provides more storage space, especially beneficial when transporting bulky cargo. Furthermore, it can be transported on standard truck trailers without exceeding the maximum permissible length. 45 foot container is a direct competitor to conventional semitrailers in Europe. Thus, according to the shipping companies, these containers will replace conventional semitrailers. Containers made of steel (in most cases of alloy steel, COR-TEN steel) so firmly that they are placed in vessels of thirteen or more rows and secured by twistlocks (ang. Twistlocks). Along with widespread standard containers of 20 feet and 40 feet, there are different versions of special containers such as refrigerated containers for transportation of perishable goods, tank containers for liquid and gaseous substances, containers for transport by road, the unit containers or containers for transportation of animals. Each sea container has its own room, it consists of four capital letters (Prefix), three of which are determined by the owner of the container and seven digits, one of which is the control. The maximum weight of the goods in the container is usually negotiated with the carrier, as may have restrictions on the maximum weight that can take your port, and weight restrictions on transportation within the country. Usually we can send the container to the weighing 26-27 tons of cargo in the container. There are a variety of freight rates for light (up to 18-21 tons) and heavy containers 20futovogo container in marine lines. During transportation inside the country also consider the weight of the container (see below -. "Containers").